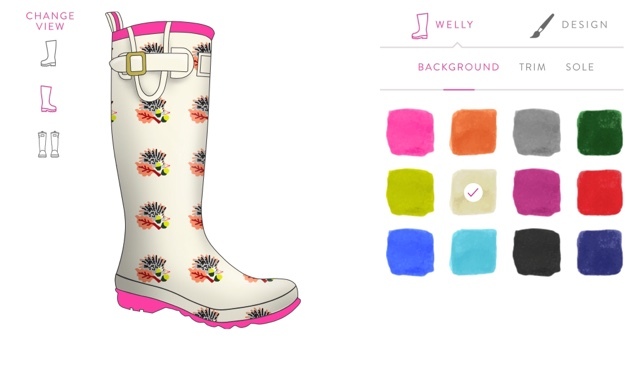 Joules have a creative competition running; design your own Joules wellies! You may be surprised to know that I do not actually own a pair of wellies, not even Joules wellies. I do, however, have a lovely pair of navy blue Joules muck boots which can often be seen in my YouTube vlogs when we go out for walks in countryside with Digby. Some people would describe them as moon boots, but basically they are half a boot, and they have laces. They are super comfy and I can rely on them for all-terrain and most weather conditions. I have some ice-grips for fitting over my boots should we need to trek out in snow, but I haven't had to use them yet! The downside to the muck boots is they aren't easy to put on and take off. I can't slip into them, as I would a welly boot and I can't quickly discard them; which is a bit of a nuisance when they are too muddy to keep on and the dog is too muddy to also walk through the house! So I had a quick attempt at designing a print for a Joules welly on the iPad. It is a bit rudimentary and I'm not sure if I could have improved it. But I did draw it with my finger rather than a stylus, so I don't think I did too badly. I started drawing a russet-orange oak leaf, complete with acorn, then decided to add a hedgehog in the background. The colour selection is minimal, but sum up the most popular Joules colour palette nicely. The boot itself is cream and the trim and sole are both bright pink. The first prize is a luxury break worth £5,000 plus the winning design will be printed on boots available to buy at Joules.com. 10 runners up will receive £250 Joules vouchers. What do you think of my design? What would your welly look like? Have you already designed one?